Back when a greenhouse was a structure used to grow plants in cold weather, an oil pump was just a non-descript but necessary device to keep metal engine parts well lubricated. As engineers work to meet the 35.5 mile per gallon Corporate Average Fuel Economy (CAFE) standard, the lowly oil pump has become one of many places where they can find incremental improvements in efficiency. The turbocharged 1.4-liter inline-four in the 2011 Chevrolet Cruze features a variable displacement oil pump that helps reduce the parasitic losses that increase fuel consumption. While an engine always needs oil, the amount depends on the speed and load at any given time. Traditional oil pumps are driven off the engine and sized for the worst case conditions the engine is expected to experience. As a result, they typically move much more oil than the engine needs, and the excess is dumped back to the oil pan through a bypass. The variable displacement pump on the Cruze engine is electronically controlled so that it only sends out as much oil as the engine needs. 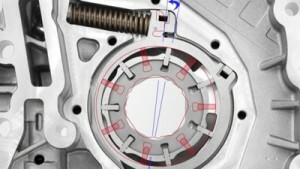 Spring-loaded vanes sit in slots in the drive hub of the pump as it rotates in an off-center housing. As the hub rotates from the pump inlet to the outlet, the vanes are pushed in and the cavity between them gets smaller causing the oil pressure to rise. A larger difference between the inlet and outlet volume means more oil pressure and flow. The outer housing of the General Motors pump is mounted on a pivot, which allows the center of the housing to move closer to the center of the hub. This reduces the volume change in the pump and the resulting oil flow. According to GM spokesman Tom Read, the efficiency improvement attributable directly to the new oil pump is “less than one percent.” However, when added together with other, similar features like thermostatic shutters that close off the grille at higher speeds and the electric power assisted steering, it adds up to a car that gets an EPA rating of 40 miles per gallon on the highway.